_Charles Ingham Black, an Irish Anglican, from Sligo, educated at Trinity College Dublin, was in 1855 installed as the curate of Burley. He was apparently well connected, and Speight, in his book, Upper Wharfedale, (1900), records family links with Lord Palmerston, the Prime Minister in the years 1855 to 1865. He also had “very kindly and intimate relations with the late Princess Alice”, a daughter of Queen Victoria, married to a German royal, when in 1867–8 he acted as English Chaplain in the old Rhineland spa town of Darmstadt. His first act was to make Burley a parish separate from that of Otley. He therefore became the first Vicar of Burley. The parish included Menston until 1876, when Black encouraged its separation from Burley. For forty years he remained Vicar and along with the Fisons and Forsters, saw much change in the village. The parish Church was refurbished in the 1870s, the mills prospered, the population grew and he kept records of the changes brought about in the National School in Back Lane. Black contributed to the growth in population in no small way himself, as the Census records show. He and his wife Anne, who came from the Home Counties, had eleven children in Burley. According to Speight, Black was “ student all his life, an excellent theologian and classical scholar, and a writer of prose and verse”. He composed a number of Carols and his memorial window in Church features scenes from the nativity. 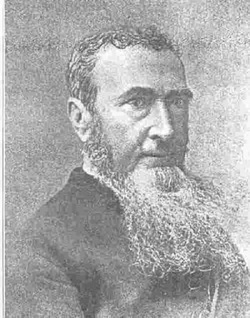 Speight also mentions his sermons in glowing terms, though Jane Forster in one of her letters is not so magnanimous, claiming that she got headaches after listening to him preach. He died in Burley in 1896 leaving many records of his time here. See also the book “Two Centuries of Change” by Margaret and Dennis Warwick, the history of the parish of Burley in Wharfedale. Available from the Library and the Post Office, price £10.